Cork Chamber of Commerce calls for an increase in flights to boost growth in the south of Ireland. 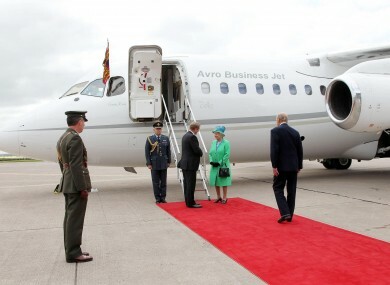 Taoiseach Enda Kenny saying goodbye to Queen Elizabeth II and the Duke of Edinburgh as they depart from Cork Airport last year. AN INCREASED NUMBER of routes and services to and from Cork Airport is needed to sustain and grow business activity in the south of Ireland, according to a new survey by Cork Chamber of Commerce. Of 324 business owners and senior managers surveyed in the region, 41 per cent expressed dissatisfaction with the range of routes available from the airport. Almost six out of ten businesses relied on flights to London and Amsterdam Schipol, in large part because travellers require ongoing connections following the closure of the Cork- Dublin route by Aer Lingus and Ryanair. More than half of all indirect travel completed by businesses from Cork Airport is to the United States, with 57 per cent to New York, Boston, San Francisco, Chicago and Los Angeles. A further quarter is to Germany, with 11.9 per cent to Frankfurt. ‘The results of the survey and future projected air travel trends all reinforce the need for increased route development from Cork Airport, increased frequencies and competitive costs to sustain and grow business activity within the South of Ireland” said Conor Healy, Cork Chamber CEO. Aer Lingus emerged as the preferred airline for more than three quarters (76 per cent) of businesses traveling to the UK and 85% of those traveling to Europe for work purposes. Email “Lack of flights to Cork hampering business in region”. Feedback on “Lack of flights to Cork hampering business in region”.